There is a $10.00 out of state research fee for all copies ordered from the Tulsa county Central Library. However, if you order copies through Inter-Library Loan from your own local library then the charge is only 50 cents per copy. The Central Library has copies of all of Tulsa's city newspapers on microfilm. This is one of only two places (that I'm aware of) that these microfilms are available. The major city newspapers are/were The Tulsa Daily World and the Tulsa DailyTribune. The World is the morning paper and the Tribune was the evening paper. A few years ago the Tribune sold out to the World and there is now only one major newspaper for Tulsa. The other place that has copies of all of these microfilms is the Oklahoma Historical Society, Oklahoma City, OK. Note that the Obituaries themselves are not indexed. The Death Notices contain basic information such as name, date of death, sometimes residence information, and place of burial/memorial service. There are also a large number of newspaper clippings and other items in the vertical files here. They are indexed and searchable, but not printable, by heading name and location, these clippings are fairly recent (starting around 1960), but there are numerous historical clippings that apply too much earlier dates. The Library has a huge reference section of information on Tulsa businesses. Many of these references go back to the very earliest oil companies. You have to have an idea of what company your ancestor worked for for this source to be of any value to you. 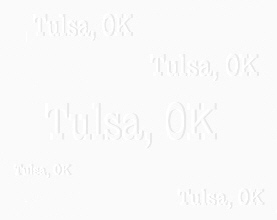 There is a large selection of maps of Tulsa county. Most information of interest to family historians is located at the Tulsa Genealogy Library.